Once you went niche, there’ll be no turning back. At least, that’s how I feel about niche fragrances. Somehow, they attracted me with their specific, unique blending and simple packaging. Let’s just say they succumbed me with their intellectually stimulating scents. Two of my favorite brands are Diptyque and Maison Francis Kurkdjian. Both from Paris, and what I’ve learned from my previous visits to the city of love, most of the people there really appreciate nice scents. Once, a hotel receptionist (an old guy) in a Paris’ hotel complimented me on the scent that I was wearing. I know, right? The latest launch in Indonesia for the two brands are Diptyque Eau Moheli and Maison Francis Kurkdjian Aqua Vitae. Both in EDT, light and fresh for warmer days. Dyptique Eau Moheli is a bit on the sweeter scent, coming from a flower ylang-ylang which grows and harvested on Moheli, one of the smallest islands in Comoros, the Indian Ocean. The latest addition to the Floral Water Collection (after Eau Rose a few years back), Eau Moheli is a beautiful bouquet of exotic flowers scent mixed with green notes, peppery spices and woody notes. The most interesting part about the tropical flower ylang-ylang used for this fragrance, they have to be cut every week at dawn, or else they will loose their scent. And the distillation process which conducted locally can take up to 20 hours. Considered a summer fragrance, Dyptique Eau Moheli is perfect for those who want floral fragrance without being too flowery. The other must have fragrance in our warm climate is Maison Francis Kurkdjian Aqua Vitae. Inspired by one of Francis’ own trip to Formentera in the Balearic island (at the Mediterranean), when one afternoon he rides an old motorbike. It was blazing hot, but the cool wind touched his face. That beautiful feelings created Aqua Vitae, the water of life. Citrusy, woody and musky, it’s an easy, simple fragrance for man and woman. Lemon from Calabria, Mandarin from Sicily, Tonka Bean from Brazil, vanilla infusion, hedione and guaiac wood were chosen by Francis to make this relaxing scent. Yes, somehow I personally feel that it’s such a relaxing fragrance, soft like second skin but better. What I love about both fragrances, even though they come in EDT, don’t let the light textures fooled you. They sit on my skin quite long during my active days and don’t you just love when your fragrance stayed close to you all the time? I know I did. Really fast as I typed, have you had any ideas of what to give to your loved ones, or simply what make up looks do you want to pull off on that special day? You’ll find an amazing array of gift sets in The Body Shop Indonesia’s stores. With so many choices, ranging price from Rp 99.000 (really? ), the Lebaran’s gifts will be in stores from July 25, 2013. Last week I was invited by The Body Shop Indonesia’s media gathering to break fasting together with fellow medias and bloggers. The event was held at Hotel Mulia Senayan, Jakarta, where the team sent out inspirational gifts and looks for Lebaran. Inspired by Morocco, every single gift box was wrapped beautifully, it’s impossible not to find the perfect gift for your loved ones. If you’re a perfectionist and you want to pick out your own gifts from The Body Shop’s massive products in their stores, no fret. You, yes you, can “create your own gift”. Pick the products in stores and The Body Shop Indonesia’s team will wrap your gifts instantly in front of your very eyes. And the beauty of Ramadan didn’t stop there. The Body Shop Indonesia’s makeup artists, created three special looks for Lebaran. Easy to achieve and not intimidating for Lebaran (trust me your parent in law won’t comment on your look this year), three looks called ‘So soft & shimmery’, ‘Bright Rosy Lip’ and ‘Intense Smokey Eye’. Excuse me for such hiatus posting lately, as I’ve been busy with my latest online shopping craze. Yes readers, I’m officially an online shopping owner named RICHE Accessories. From my background in some women’s lifestyle magazine before, and currently as a lifestyle blogger, I hugely believe there’s no easier way in this world of styling to dress up an outfit than with some eye-catching accessories. You can make a simple look, let’s just say: boyfriend jeans and a basic tee or a solid black dress look visually interesting with a statement necklace. 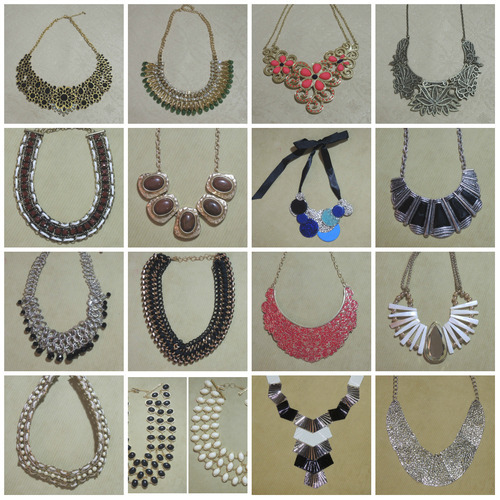 Just like lipstick, and shoes, and bags, I believe that a lady can’t have enough statement necklaces. They’re one of my favorite pieces that will surely add dimension to any outfit. You won’t feel sorry to invest in bold statement jewels that’ll add serious sparkle to any of your outfit. I’m pretty sure that you’ll find some new love you’ll never want to take off, from RICHE Accessories unparalleled selection. Ranging from statement necklaces to stacked bangles and multiple rings, I hope you love shopping RICHE as much as I’m enjoying building it. And I’m trying my best to keep the online shopping updated twice a month. Make sure you keep on checking HERE. And last but not least, I believe statement accessories will speak for themselves. So if you’re looking for something bold but not loud, to make you look lovely for less, you are my future customer(s). My hair condition. Dry strands. Yikes! How I love hair washing at salon. Tadaaaaa!!! Hair do & make up done. Kérastase and Lancôme Indonesia joined forces to bring beauty bloggers, a special pampering day. Named Super Serum Duo Pampering Day, me and fellow beauty bloggers experienced the duo super breakthrough ritual at Irwan Team Hair Design Salon, Central Park Shopping Mall, Jakarta, Indonesia last Thursday. This exclusive bloggers only event was held to introduce the latest skincare innovation from Lancôme, Advanced Génifique and the breakthrough discovery for hair from Kérastase, Initialiste. In case you’ve missed my previous blog’s post for the introduction of both products here, Advanced Génifique and Initialiste have two same goals, to beautify. Are you familiar with the previous Génifique which was launched back in 2009 and noted as one of the beauty revolution? Well, it was the first Youth Activating Concentrate which effectively returns the skin back to its youthful quality, based on our genes and protein relation. What differs the previous Génifique with the Advanced Génifique? Except the advanced formulas with 40% more active ingredients so we can see faster result (they claimed in 7 days), Advanced Génifique has different texture (from my experience it’s more of a light gel than the previous liquid texture) which made it absorb better, and (the best part of all) it has a new advanced dropper design. The bottle may not change, but for sure it has this self-loading dropper, so no more lucky guess of how many drops should we put on our face and neck for each application. It may be used for day and night as a booster before serum, as our genes are practically weakened by aging. In the morning, it’ll help to activate the genes, and at night it’ll repair the skin to boost the protein production. As the good people at Lancôme said, we can see and feel the improvements and reactivation of the 10 key signs of youth on our skin. Well, that was the concentrate for skin. How about hair? As precious as stem cells for the skin, same here for the hair. There are 2 stem cells pools at the hair follicle’s level, which able to renew the follicle and hair generation. Initialiste, the first ever hair serum will impulse the hair growth at its source, creating more beautiful and stronger hair. In my opinion, its’ texture (easily absorbed) and scent (not overpowering like some hair products) exactly resemble the best of skin serum product, right down to the bottle and its’ dropper. Make sure you don’t get the wrong product for each. How to use Initialiste? Apply on clean shampooed hair, twice per week on thin hair and up to 3 times per week on normal to thick hair. As it’s a leave-in formula, do not rinse and style as usual. At the bloggers’ event, I got my skin and hair on both products. I went in the salon with my dirty oily hair & undone face (you don’t want to see the before picture) and I went out with my lustrous, blow-dried hair and luminous skin (you can see my after pic above). Thanks for a super pampering day, team Kérastase and Lancôme Indonesia.